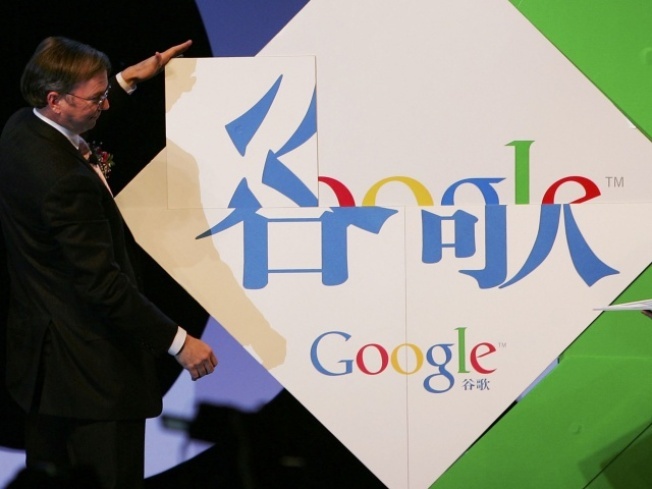 Google chief executive Eric Schmidt spells Chinese characters 'Gu Ge' at the inauguration of the company new Chinese brand name April 12, 2006 in Beijing, China. Google said it has adopted the Chinese-language brand name 'Gu Ge' for its Chinese operations, with Google chief executive Eric Schmidt saying the new name demonstrated Google's commitment to China. Google may launch a new app store in China after mostly leaving the country in 2010, according to reports. Google has been in talks with app makers to create a new app store in China to help distribute apps and games, the Wall Street Journal reported. Apparently there have been plenty of Android app stores popping up in China, although rife with pirated apps. Unlike the U.S., which has primarily two main app stores -- Apple's App Store and Google's Play store -- China has so many app stores that developers "hire large teams just to manage relations" with them. Google's Chinese version of Play would calm some of the chaos and, of course, bring in cash. However, Google is now facing "stiff competition" and entering pretty late in the app store game. Experts say that Google will likely have to join with a Chinese company to streamline the process. It seems as if Google may have regretted its departure from China, but its unclear if this new move will help it re-establish itself in the country.